To access this superb off-the-beaten-path site, visitors have to drive 6 miles on privately-maintained Cow Creek Grade. The dirt road can be rough, but the drive is worth it. 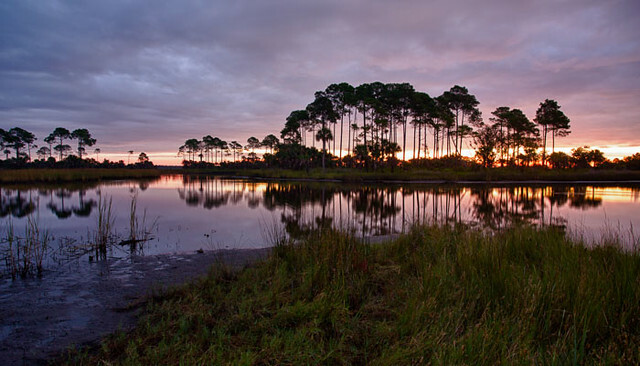 Good dike roads within the WMA surround the impoundment providing excellent vantages of brackish marsh and scattered islands of sabal palms and oaks. The southernmost edge of the site overlooks salt marsh good for Marsh Wren and Seaside Sparrow; the northernmost edge tunnels through thick, scenic, coastal hardwood swamp. An observation tower is located near the midpoint of the impoundment road; boat ramps are available as well. Wintering ducks and shorebirds are this site’s real forte. More than 20 species of duck have been recorded; Northern Shoveler, Redhead, Lesser Scaup and Hooded Merganser are common. Look for wintering and migratory shorebirds; Reddish Egret and Roseate Spoonbill can be found in the fall. In late spring, look for Gull-billed Terns, and Black Terns in late summer. During spring and fall migration 20+ species of wood-warbler have been recorded including Kentucky and Tennessee; Hooded and Swainson’s breed in the area. Rarities such as Ross’s Goose and Lapland Longspur have been found. More than 75 butterfly species have been recorded at this site; click here for more details. On the west side of the impoundment, the Bat House Trail runs for 1 mile past a large bat house used by Brazilian Free-tailed Bats. Seasonal hunting takes place at this site, please click here for more details.